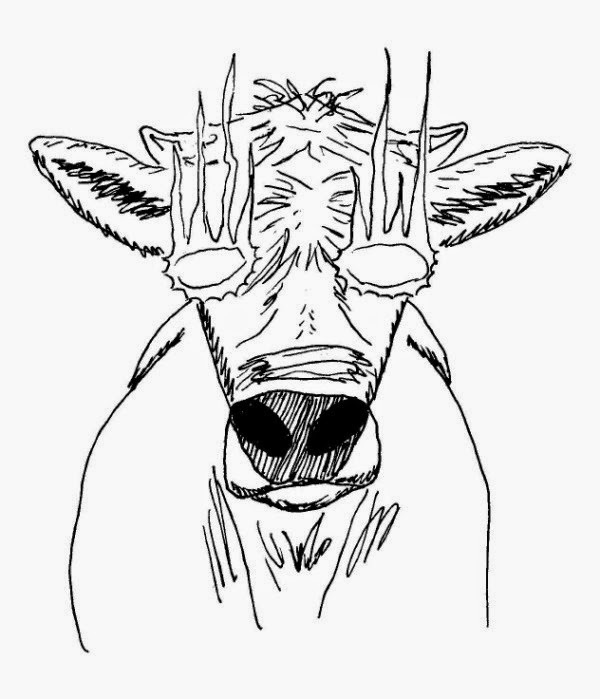 Genius Loci Games: [Mini-Review] Deviant Database: The Cow goes ... BOOM!!! [Mini-Review] Deviant Database: The Cow goes ... BOOM!!! Late last year when I discovered Mutant Future, +Tim Snider sent me his databases of creatures and a few other things to get me along the path of playing and running Mutant Future. Since then I have been rather busy with life, projects, kickstarters and the like. However, I have managed to run two very short Mutant Future games and it was all thanks to the Deviant Databases that Time sent me. I will eventually get around to reviewing the second Database as well as Tim's freaking awesome Thundarr setting and his massive adventure collection but right now I just want to gush (can I use that as a rating?) 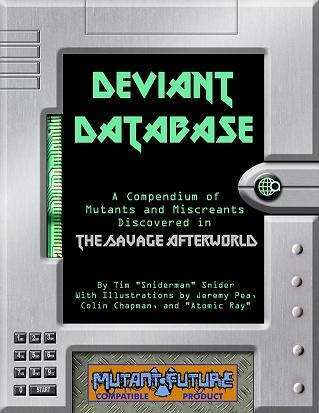 over the first Database; Deviant Database. 80s when my friends and I used to invent the most "METAL" nightmares ever for comic books that never came to be and stories that languished in composition books. Let me be clear, this is not a bad thing! Tim's presentation, attention to detail and profession prowess infuse this book with a level of neatness that I am frankly jealous of. No, when I speak of long-gone days of youth I mean in imaginative wellspring that this book locks into. For my first outing in running Mutant Future I borrowed heavily from Fallout. When our intrepid vault dwellers left the vault and into the mutated wastelands of a far-flung future the first things they encountered were unattended cows ... cows, simple cows. Our one player remember stories passed down from his great-grandfather of summer nights tipping cows. Wanting to revive the family tradition he stood into the herd of sleeping bovines and tipped one over ... causing it and every other cow in the heard to explode in atomic glee. TPK. Yes, atomic exploding cows! The creature is called an Atomicow (p. 5) and has since been adapted to both my 5e and Swords & Wizardry games because there is something utterly glorious of brave adventurers fleeing in terror from a herd of cows (even the non-atomic kind). This is what I mean by that kicked in door of youthful imaginative. No adult would ever thing of this, it would be too unrealistic or some other nonsense that is utterly untrue! Oh yes there are scary and serious and all of that in the Database, but the youthful out-there is this book's bread and butter and it glories in it! From ant zebras (p 79), to living pumpkins (p. 61) and the truly creepy Glovblume (p. 33)this book is packed with the truly crazy and out-there things I think more of the hobby needs. Rating 4.5 out of 5 Atomicows! Deviant Database is available at Drivethrurpg.com for $5.95 and is totally worth the price of admission!